Right now, hundreds of abandoned dogs are roaming in the Everglades area of Florida (Florida City, Homestead and Redlands) and the surrounding areas of SE Florida. They are hungry, thirsty, injured, sick, pregnant and more. They have been dumped there by their previous owners, often after being neglected and abused for years. These poor, lost souls are left to survive in the harshest of conditions. They battle extreme heat and dehydration, endure mosquito attacks and tick infestations, suffer from heartworm and mange, dodge speeding cars, and fight off poisonous snakes, alligators and other wild animals. We have grown so large since our beginning that we now also assist police in cruelty cases, and rescue dogs from all around Miami-Dade County. Our mission is to rescue them, bring them back to health, and show them that not all humans are bad, and that love and a warm bed are just around the corner. Beyond that, we work to raise awareness about this brutal reality happening right in our community, with the hope that our message will result in alternative solutions and more responsible and humane decisions by pet owners. We are a 100% NO KILL 501c(3) organization, fully dependent on community support to fund our rescues and veterinary bills for these desperate pups. Please help us make a difference by donating, adopting, fostering and being a voice for these helpless animals. Over 3,700 lives saved! We can't do this alone.There is power in numbers! 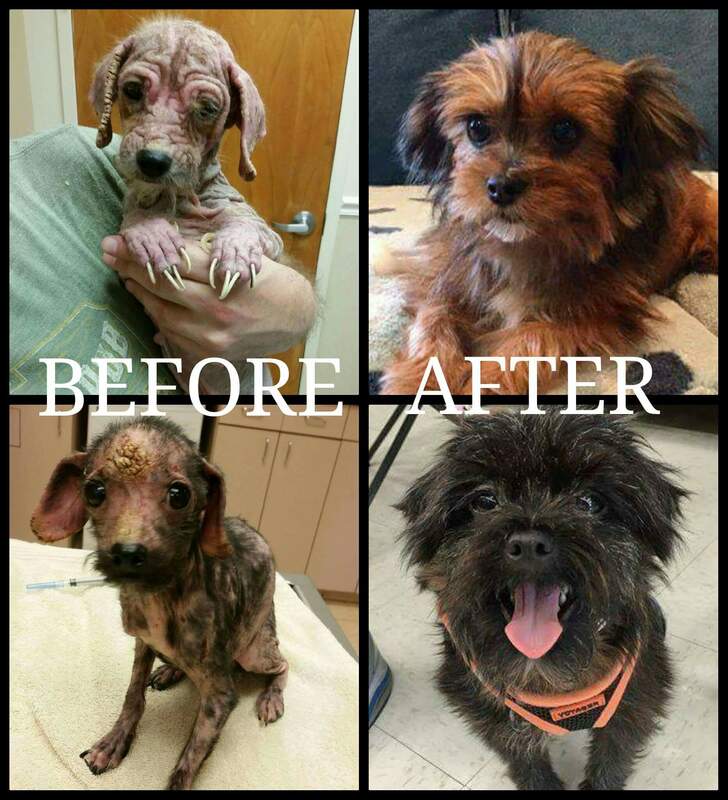 Rescue, Revive, Rehome! Powder, rescued from the brink of death, found in the Redlands, blind, emaciated, unable to walk. She had gone into the bushes to die, after being seen lying in the same spot on the side of the road for days. We got the call and we ran! We pulled her into safety, got her the best medical care, showed her what love is, and she bounced back amazingly! She has been adopted into a loving home with 2 other 100+ alumni dogs. Frances, rescued from an abandoned building, in Miami chained to the door, infested with thousands of ticks, her eyes so badly damaged and ruptured that they had to be removed. We were on another rescue when we got the call about her, and as soon as we saw the photo we ran to her..we could not believe our eyes, or that several people knew she was there and did nothing! She has also been adopted into a loving home with our very own crew member who was there at her rescue, Jan and her husband Eric. Will & Grace, rescued from a hoarding house in Liberty City.. lovingly fostered and shown they can trust humans again. Grace is adopted and loving her new life, and Will has an adoption pending. Albert, pulled from MDAS on his last hour, he had to undergo 10 blood transfusions, had two emergency surgeries to try and save his life, one of which had never been performed on a dog, he had all of his large intestines removed. He endured daily vet checks, which after a year of treatment have now been able to be spaced out to every 6 months. Over $20,000 to save one life, we believe he is worth it! He is still looking for the perfect forever home while being in a loving foster. Zeus, rescued from living outside in a cage, starved and close to death, we assisted with animal control to have him removed from the property, and then pulled him into safety with our rescue and got him the best medical care. Adopted and thriving! Buster, pulled from MDAS on his last hour, so badly neglected we had no idea what breed he was, and just a baby, he is thriving after receiving around the clock care with our specialty vet. Adopted and thriving! Frances, rescued from being left to die, on a chain, attached to an abandoned building, infested with thousands of ticks, eyes so badly damaged they needed to be removed. Now loving life with her new family. Just a few photos of us on location at various areas around SW Miami Dade, rescuing the abandoned dogs roaming the vast nothingness. And also photos of us helping in areas like Liberty City, Little Haiti and Hialeah with cruelty and hoarding cases. We will go anywhere, at anytime of day or night to save a life, and we have. With your continued support we can save even more! Right now, there are hundreds of abandoned dogs roaming in the Everglades area of Florida (Florida City, Homestead and Redlands) and the surrounding areas of SW Miami Dade. They are hungry, thirsty, injured, sick, pregnant and more. They have been dumped there by their previous owners, often after being neglected and abused for years. These poor, lost souls are left to survive in the harshest of conditions. They battle extreme heat and dehydration, endure mosquito attacks, flea and tick infestations, suffer from heartworm and mange, dodge speeding cars, and fight off poisonous snakes, alligators and other wild animals. We have grown so large since our beginning that we now also assist police in cruelty cases, and rescue all around Miami-Dade County. Our mission is to rescue them, bring them back to health, no matter the cost, and show them that not all humans are bad, and that love and a warm bed are just around the corner. Beyond that, we work to raise awareness about this brutal reality happening right in our community, with the hope that our message will result in alternative solutions and more responsible and humane decisions by pet owners. We are a 100% NO KILL 501c(3) organization, fully dependent on community support to fund our rescues and veterinary bills for these desperate pups. Please help us make a difference by donating, adopting, fostering and being a voice for these helpless animals. Over 3,700 dogs and 90 cats saved to date! We help supply several other local rescues in the affected areas with much needed food and supplies for the dumped and abandoned dogs awaiting rescue on the streets. We also supply other local rescues that are inundated with large amounts of rescued animals of their own with much needed food. And this year we added humanitarian aid for some of the most damaged areas from the hurricanes, we send food and supplies to Texas, and to the Keys. We have a youth volunteer program to help get more of our young people involved in our mission, as well as an active education program where we actually go and speak at local schools to the children to educate them on the issues around them, and hopefully prevent the next generation from treating our animals as a throw away commodity. We also teach the importance of spay and neuter along with proper medical care of animals.